Pop Warner sets limits on the size of each team, depending on the number of adult coaches. There are no tryouts. The Cheer Commissioner assigns participants to teams based on several criteria. When signing up, pick the team your daughter best qualifies based on age and you will be notified of changes. Team placements will be announced in mid-July. We cannot announce teams prior to that time. After August 15th, team placement will not change unless there is an eligibility issue. The traditional season begins August 1st and runs through the end of October. The season will continue through the next competition date as the team qualifies to advance. Eastern Region Qualifiers are mid-November, and Nationals are early-December. The Spring Cheer season starts on January 1st and concludes mid-May. Practice time is defined to not include warm-up, cool-down or breaks. No team may schedule more than 10 hours of practice per week before Labor Day. During the month of August, practices are held 4 days a week. Each practice is 2 - 2.5 hours. After Labor Day, the practice schedule is reduced to typically 3 days per week; 2 hours each practice. In addition, cheerleaders cheer at the football games, which are typically held on Sundays, but may occasionally be on Saturdays. The practice schedule will be determined based on facility availability but may be any weeknight and include Saturday. 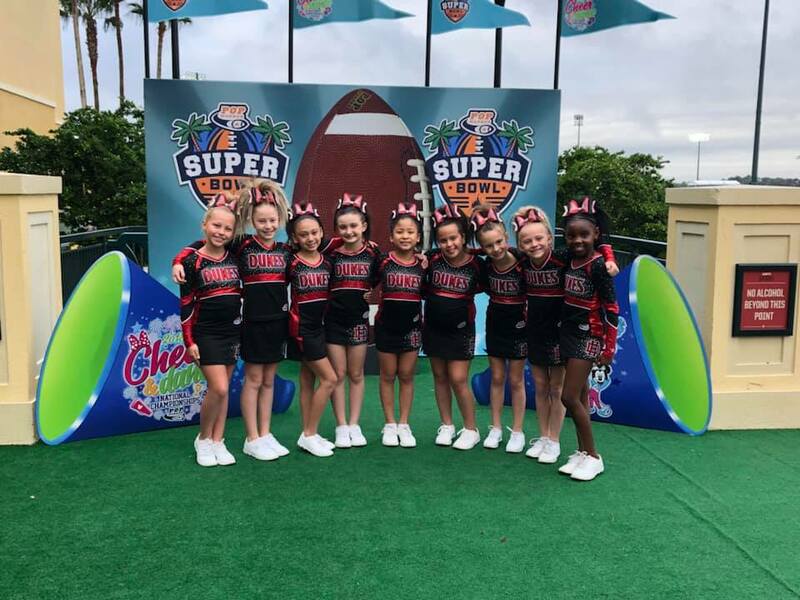 No participant that is committed to Pop Warner for the Season will be allowed to participate in an ALL-Star Cheer/Dance Program during the Pop Warner season. Due to the nature of the sport, a practice missed by one cheerleader has a significant impact on the squad, particularly on that cheerleader’s stunt team. Please schedule your family vacations during June and July, as August is a critical month where skill sets are being evaluated and team positions determined. Please contact us should you have a pre-arranged vacation in August. Each cheerleader will be required to purchase game day top, cheer shoes, socks, and boy short. Returning cheerleaders may be able to use some of their existing gear provided it is in good condition and is the same style as was used in the prior year. The Dukes will provide you with your cheerleading uniform. Competition teams are expected to purchase a team jacket as well. Your cheerleading uniform is Dukes Property and should be maintained and handed back in the same matter it was received. When washing your uniform, always pre-treat any stains. The uniform should be washed inside out with zipper and button closed, in cold water, NO fabric softener, NO chlorine bleach. The uniform should hang to dry, never put it in the dryer. Dukes-issued uniforms should be worn by the cheerleader and for Dukes games/functions only. When it is uniform return time, you will be asked to return your skirt and vest freshly washed. Failure to take proper care and failure to return all pieces at the end of the season will result in the forfeiture of your workbond. There is also a $150 uniform replacement fee. There is a League Competition in which all teams participate, which will be held in mid-October. Flag participate as exhibition-only, meaning they will not be scored but will receive feedback from the judges. All other teams will be competing, be scored, and have the opportunity to advance to the Eastern Region Qualifier competition with the acception of Mitey Mite. Eastern Region Qualifiers is typically held the last weekend in October or the first weekend in November. Eastern Region Championships are held mid-November. First and second place teams at Regions typically qualify for Nationals. Pop Warner National Cheer and Dance Championship Competition is held at Disney World in Orlando, Florida. The competition typically is the first full week in December. Pop Warner Travel puts together packages that include room and park passes. The minimum stay allowed is a 3-night stay in Orlando. Pop Warner provides a letter for your child's school to explain the absence. Volunteers under 18 years of age must comply with the same procedures as a rostered cheerleader/player. A Student Demo/Jr Coach can earn service time credit for volunteering with the Dukes. Please contact the Head Cheer Commissioner to request a letter indicating the hours of service given.